Pick up and deliveries are done in secure company owned or leased vehicles that are operated by bonded company employees. This pickup will be on a preset schedule, but can be modified according to your situation. In no case will any pickup be later than 5 working days from the time of notification. Our trucks all carry dollies and equipment for moving large volumes of boxes, thus no additional help from client employees is ever requested. All deliveries will be made to the exact locations specified. 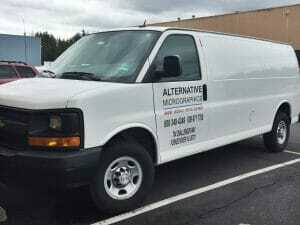 An ALTERNATIVE MICROGRAPHICS, INC. senior account representative will meet with you to determine the most economical and workable pickup and delivery schedule. This will be set up on a weekly pickup schedule so that documents can be utilized by your records retrieval department on an ongoing basis. ALTERNATIVE MICROGRAPHICS, INC. will supply specially designed document packing boxes at the rate stated in the pricing schedule with your final project proposal. Turnaround will be according to your individual requirements with an average of 5 working days. Thus the records will not be out of your service for more than 1 week at any time. All books and documents can be returned to you in the format that they were received. This includes the reassembly of the books. Sewn bound volumes will be filmed intact utilizing a book cradle device. In an emergency, we can pull any file or record, fax or overnight deliver it to you. You are never out of contact with your documents. Our managers are on a 24 hour, 7 day a week, 800 number, beeper service, so that we can be reached to fulfill requests at any hour. Microfilm jackets will hold approximately 60 images at a 24:1 reduction ratio. The original roll will be cut and inserted into 4x6 mylar/S channel/color coded microfilm jackets with the proper eye-readable indexing information typed on each jacket header. The header of the jacket can accommodate 50 alphanumeric characters on one line. The microfilm jackets will then be duplicated onto diazo duplicating fiche with the corresponding color header and index information typed left to right across the top of the fiche. The fiche duplicates will be a negative polarity, the headers positive polarity with a color stripe. This duplicate fiche will be used as a working copy. • Standards – Our microfilming procedures meets all requirements of Association for Information and Image Management (AIIM) specification for Life Expectancy (LE). Our optical disk procedures meet or exceed all present standards for optical imagery. As the state and federal agencies come up with hard guidelines we will be at the forefront of compliance. • MCS – Our exclusive Microfilming Control System maintains accurate production documentation ensuring reliable and timely processing. • Process Control – Our Allen M-20 deep tank microfilm processor is equipped with chemical replenishment by an automated mixing system. It is controlled by digital speed and thermostatic controlled heating. We monitor this processor with sensitometric testing on a daily basis. • Visual Inspection – Original and duplicate microfilm is visually inspected by our operators in microfilm viewers and on light tables. Each image on the original film is inspected on an image by image basis for acuity, file integrity, frame, pulldown, etc. We will meet or exceed the standards as outlined in the N.M.A.M.S. 104-172 Recommended Practice, Inspection, and Quality Control of First-Generation, Silver Halide Microfilm and the American National Standards Institute (ANSI). Our optical disk procedure is similar to microfilm in that we visually inspect the optical disk frame by frame and attach any electronic indexing marks for quick retrieval. • Internal Maintenance – ALTERNATIVE MICROGRAPHICS, INC. employed technicians maintain all production equipment on a 24-hour basis. This reduces critical down time which can result in missed deadlines, thereby ensuring total control over the condition of our equipment to turn out the best quality product. • Total Control – We will not utilize any outside subcontractor for any portion of this contract. All work will be handled internally, thus giving you the highest quality control. None of the records will be sent outside our facility or if done on your premises, be handled with the utmost care and secure procedure as established by your documents personnel. Client Service is designed to give you the best job possible. ALTERNATIVE MICROGRAPHICS, INC. will assign an inside and outside account manager to your account which will help with the job to job functions. The account manager is also responsible for working with the various departments and the end users. This close account coverage helps maintain a good working relationship. Facility inspection by any clients of ALTERNATIVE MICROGRAPHICS, INC. is encouraged. Our procedure manuals and the client’s own job workflow results sheets are always open for inspection. Methylene Blue archival testing of film is the industry’s standard of optimum archival testing of residual fixer and ensures the longest life possible of your microfilm originals and duplicates. Our current program uses an independent outside lab to test our film using the methylene blue procedure. Our latest test results are available on request. Microfilming Control System (MCS) – MCS documents all job functions and prints our production run sheets. MCS prioritizes the work currently in our facility to ensure that your work is ready when you need it, and enables our personnel to track the full production cycle of each microfilming project. It notes original documents locations so that they can be retrieved prior to microfilming. In case they are required by you, they can be faxed or delivered, thus you are never without access to your original documents. Optical Imaging and Computerization – Using your current computer, ALTERNATIVE MICROGRAPHICS, INC. can design and implement an electronic filing system that allows you to computerize your Information data base. All of your records can be entered onto optical disks which hold 30 to 55,000 documents each, put into a Jukebox which can hold from 22 to 50 disks, and using a LAN setup you can access any of your records from several different work stations within a few seconds. You literally have access to millions of pages of documents at your finger tips from any work station you want in your system. This system will also allow you to fax broadcast or defer transmission, auto redial, transmit from optical disk or scanner, multiple telephone directories, receive faxes and transfer to optical disk, and hundreds of other applications.